It’s funny that we buy plastic accessories to wrap up a beautiful device made from glass and aluminum. But that’s what we do. Finding a good case to protect the iPhone 5’s precious chamfer is challenging if you want something slim and matches the iPhone’s aesthetics. You want to show off the nice two-toned back. You want it to be easy and comfortable to grip. You want some drop protection. 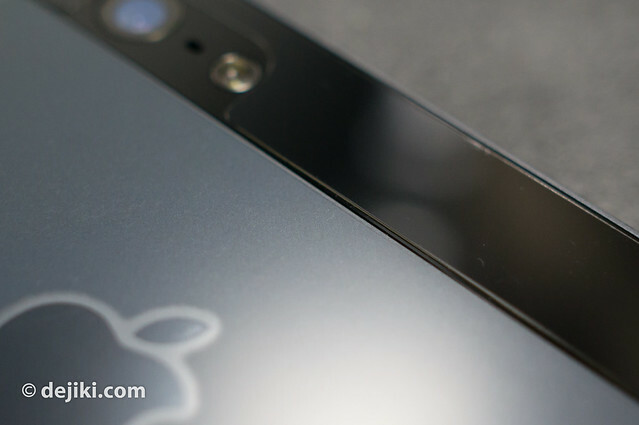 You may also want to place the phone flat on a surface on either side without worry. I got my hands on the Spigen SGP Neo Hybrid EX for iPhone 5 (Soul Black), a case I felt was ideal for my needs. Here’s a photo tour and review. 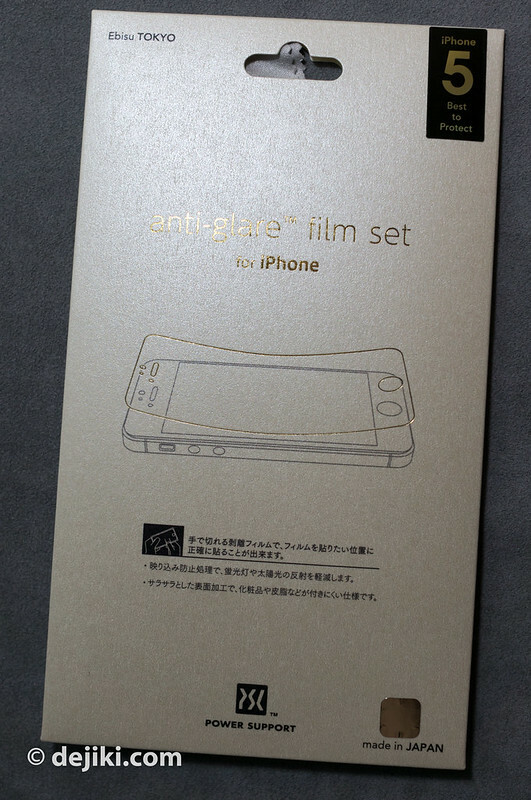 I’ll also be writing about the Tunewear TUNEFILM for iPhone 5 and Power Support Anti-Glare film set for iPhone 5. 15/10: Added more comments about the Neo Hybrid Ex. See below for addendum. 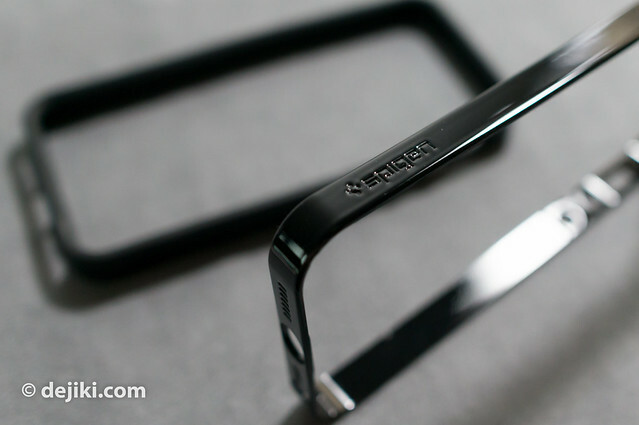 The Spigen SGP Neo Hybrid EX is a bumper-style case for the iPhone 5. The “Hybrid” feature is the use of two types of frames – a soft silicon interior to wrap around the iPhone, and a hard polycarbonate exterior to keep it shape and offer some solid heft and feel to the overall case. This allows for some customization through swapping of frames – of course, this means you have to buy multiple packages or find someone to swap with. 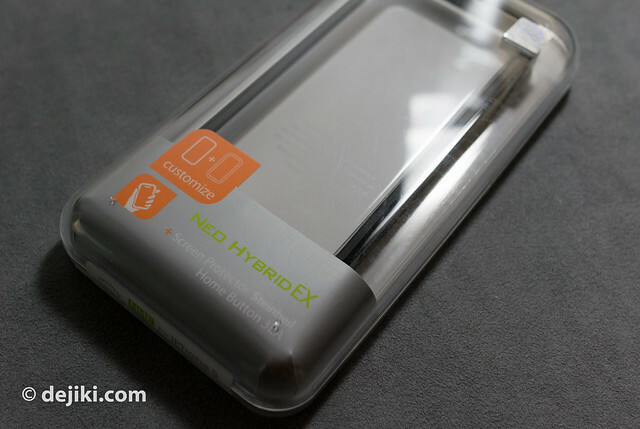 The frames for the iPhone 4/4S version of Neo Hybrid EX were eventually sold separately, so this should happen over time for the iPhone 5 version. Soul Black is the latest colour to be available in Singapore this week. Upcoming colours include Lime, Tangerine and Gunmetal. The retail price for this case is S$59.90, but the case can be found for less at some online and pushcart shops around Singapore. This case is bundled with an ensemble of accessories. 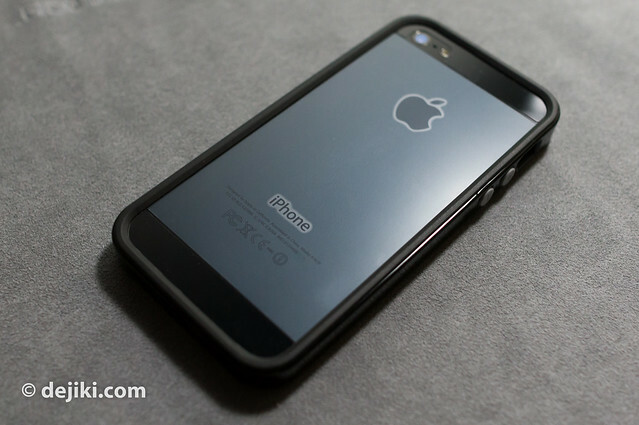 Along with the two-parter case, there are films for the front and back of the iPhone 5, three home button stickers. 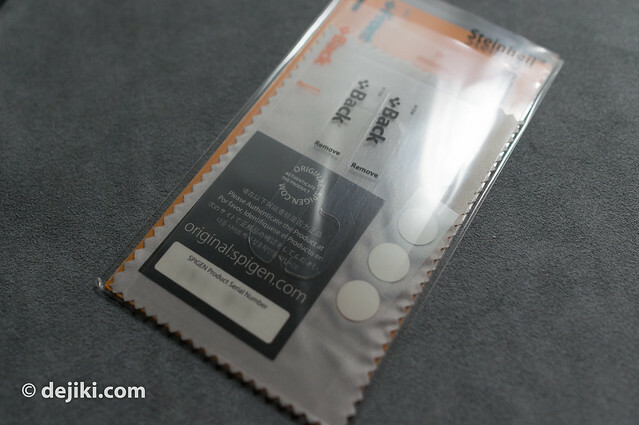 The front and back films are available as a separate product called Spigen SGP Ultra Crystal Mix (Retail price $29). The back film is actually three pieces, with the top and bottom being glossy surfaces and the larger center piece having a matte finish. 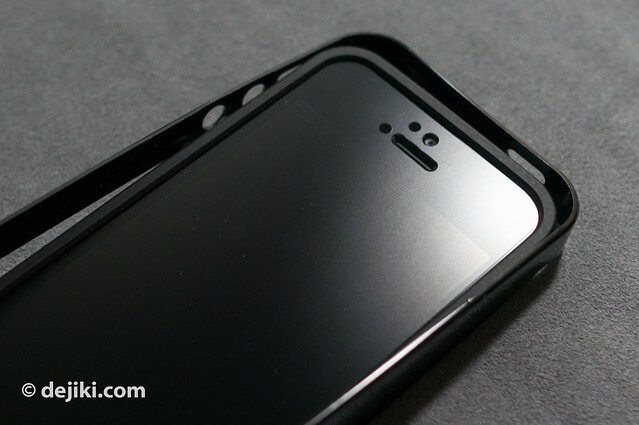 According to Spigen SGP, this preserves the original feel of the iPhone 5. The films are well-cut, although they leave a small gap between. 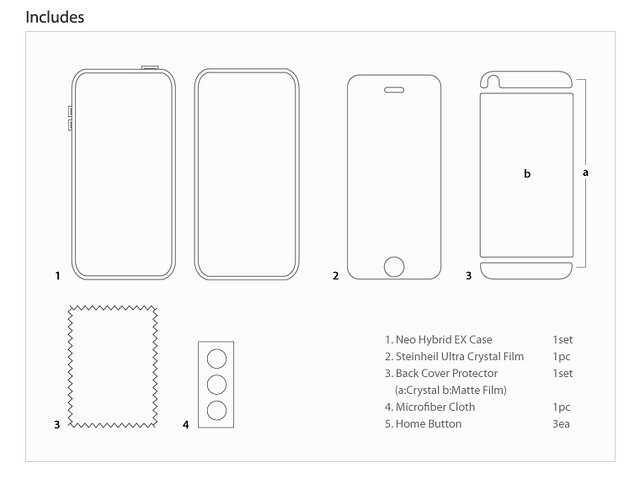 The cut-outs for the rear camera, flash and microphone could’ve been better though. It doesn’t have the unsightly bubbling effect that most one-piece films show (see Tunewear Tunefilm pictures below). For the front of my iPhone 5, I chose to use the Power Support Anti-Glare film instead. Photos and a review are available below. Installing the case is easy, though not as convenient as Apple’s one-part bumper. 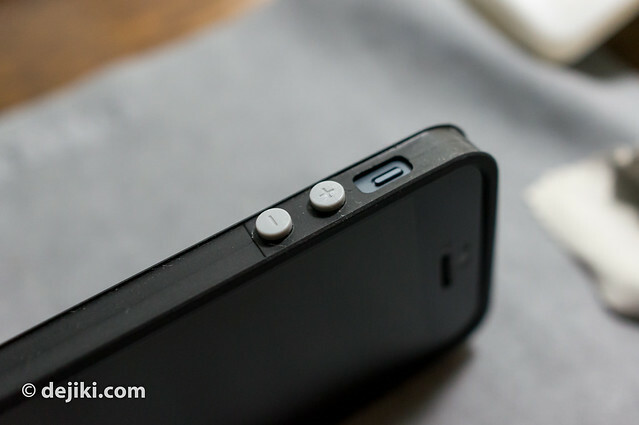 You have to first place the silicon piece around the phone and adjust the cut-outs to the buttons and ports properly. Then you slip the polycarbonate frame onto it. With the Neo Hybrid EX on, the iPhone 5 feels a little strange to handle because the frame is thicker than the body. 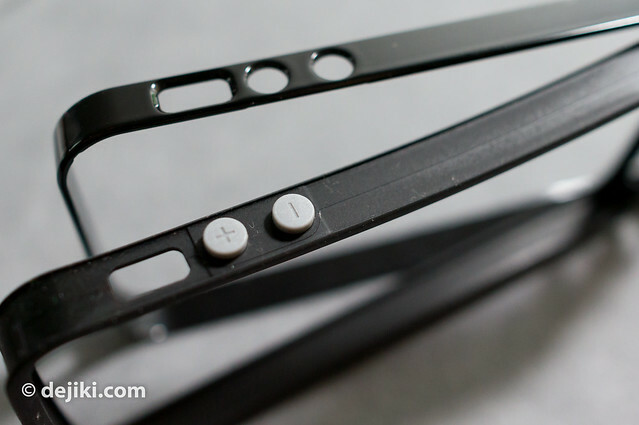 However, it is actually comfortable to handle and the silicon frame provides a good grip. It is also safe to place the iPhone on either side on any flat surface, as the lip of the silicon frame offer some elevation. UPDATED 15/10: Here are some addition comments about the case itself. With both frames on, it’s a perfect fit on the iPhone 5. I’ve heard reviews that the frames do not fit well and will slip off when removed from a pocket. I’ve not experienced this – I think the fit is just right. Then again, the Soul Black variant is newer and might have been slightly revised for a better fit. The polycarbonate frame feels solid, and is just flexible enough to facilitate removal and installation. The Volume and Sleep/Wake buttons feel very responsive with the Neo Hybrid EX on. They retain their “clickiness”, especially the volume buttons. My only wish is that the buttons were painted dark grey or just black. The iPhone 5 has a thickness of 7.6mm, and with the Neo Hybrid EX on, this becomes (about) 11mm at the thickest section (the silicon frame). Like I’ve said earlier, this might be awkward for some because the back of the iPhone is not covered, keeping the thickness of the back at 7.6mm (with a little more if you add the films). But this makes it safe to place the iPhone with its screen down, which is the purpose of having a case with the lip anyway. Disappointingly, the cutout for the headphone jack is too small for any plugs larger what Apple uses for their earphones. Even the newer Westone IEM cable plug (which is rather small) cannot fit. 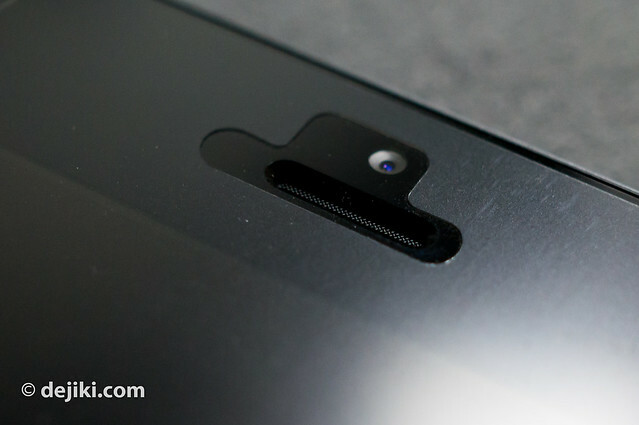 The small cutout for Lightning port connector means that the Lightining-30 Pin adapter cannot be used with the Neo Hybrid EX. But we can’t have everything. Those cutouts are small to keep the frame slim (but sturdy enough so it doesn’t break). 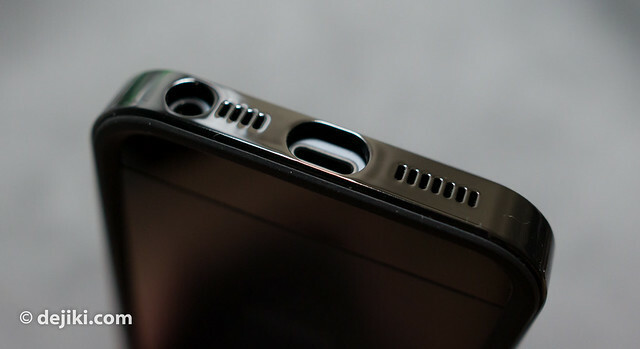 Overall, this is an excellent case for those who prefer a bumper on the iPhone 5. Tunewear’s TUNEFILM for iPhone 5 (Retail Price S$19.90) was available the very day iPhone 5 was launched in Singapore. It is clearly a rushed product. The films are poorly cut that it is impossible to install it properly without some sacrifices. I had to paste it off center with a bit of rotation, or one of the corners will be raised. Also, for the front film, the matte finish show a heavy moiré effect (white appearing as fine, fuzzy colours instead of just being white) on the screen. It has however, a nice textured feel and seemed quite resistant to oil from fingerprints. There is a bubbling effect at the back, between the parts where the aluminum back meets the glass (or plastic) pieces. This is because the back of the iPhone 5 is not actually flat at all. The black pieces are either recessed or raised from the aluminum back. 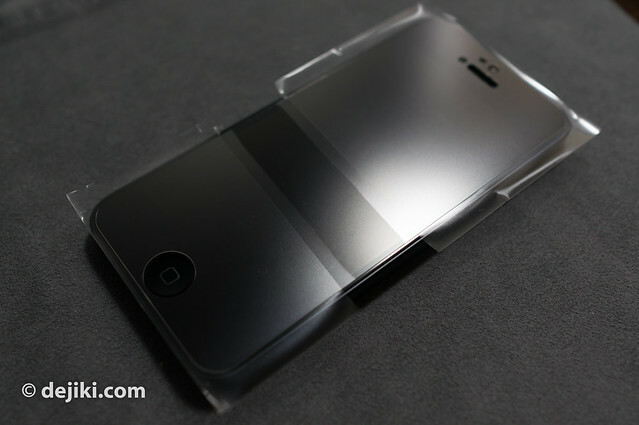 Power Support Anti-glare film set for iPhone 5 is one of the best anti-glare screen protectors you can buy. Personally, I feel that only Spigen SGP’s Ultra Optics/Ultra Fine films qualify to rival Power Support. 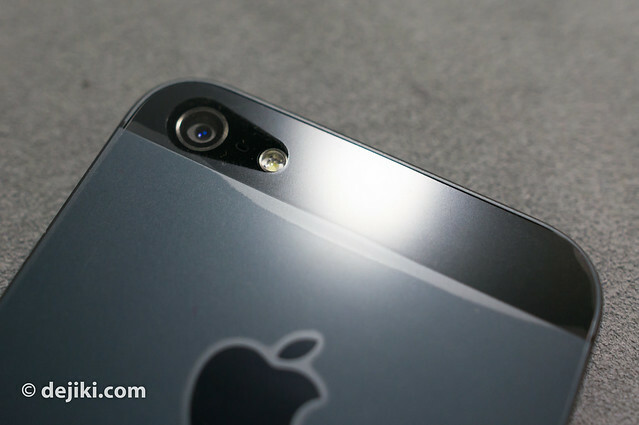 The company did not rush production and only started shipping out films after the iPhone 5 was released. Power Support films for iPhone 5 were only available in Singapore early this week. The packaging is a departure from the usual design the company had used for years – silver packaging (PawaSapo version, if it’s intended to be sold in Japan) or a green packaging with a strip in the middle (Power Support USA). The ones available in Singapore are the PawaSapo variety, but apart from packaging differences, the films are the same. Designed and manufactured in Japan, the films are precisely cut from better materials and very easy to apply. There’s no fight between these films by Power Support and Spigen SGP (priced at S$25~30 for a set of 2 films) and the cheaper variety that costs less than $10. Included in each package are two films, a cleaning cloth, and a dust remover. This is actually a large sticker that you paste over the entire display, and peel off to remove dust. It’s pretty effective. Installing the film is easy. 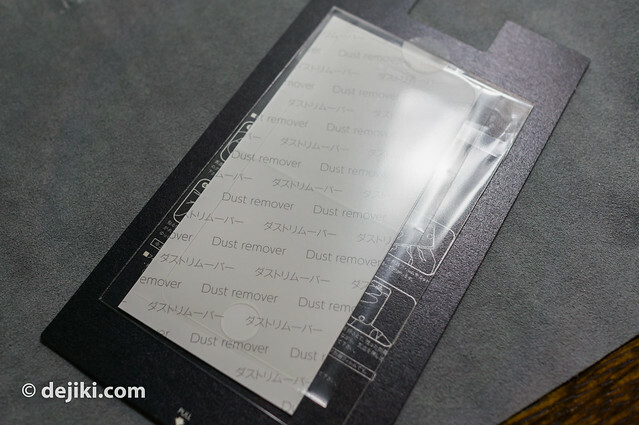 After cleaning the screen with the supplied cloth and dust remover, tear off the strip of application film from the centre and align the film onto the iPhone 5 screen, pressing the entire film down to make sure. As only the centre strip of the film will adhere to the screen, it’s easy to peel off and try again without affecting the other parts of the screen protector. Once everything is okay, peel the strip next to the one in the center, and continue to press that part of the film down, slowly working to the two ends. This “from the centre” method ensures less bubbles and the best alignment right from the start. These high quality films are very forgiving to bubbles, in fact it capable of not having any bubbles even when dust is trapped in between the film and the screen. This can get a little annoying. Unlike bubbles, you can’t push the specks of dust out and they appear when the screen is lit. 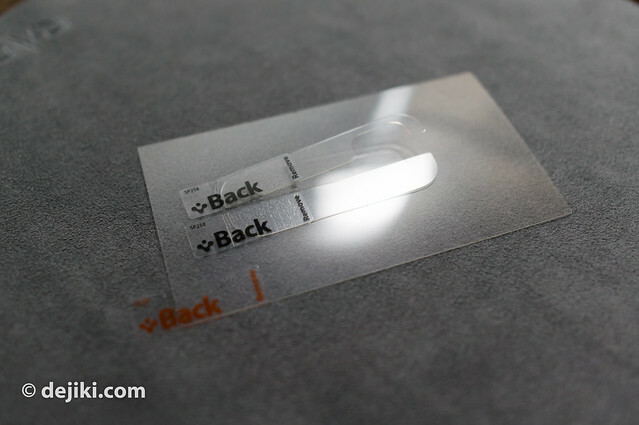 Have some scotch tape ready to remove tiny specks of dust from the film or iPhone screen. It takes a bit of patience, but as Power Support chose to create cut-outs for every sensor on the front of the iPhone, it’s easier to tell if the alignment is off. The film is also smaller than the screen’s entire surface (it leaves about 0.5mm all around), so small offsets in alignment become completely negligible. As for the film itself, the matte surface is very smooth to touch. There is still a bit of moiré effect that is unavoidable for matte films. However, it is certainly a huge improvement from cheap films because the effect is mostly unnoticeable. Thank you for your feedback. I’ve updated the entry with more information about the case. Yes, it’s 11mm – Give or take 1mm, I don’t have vernier calipers.